Designed with the worker in mind, this wallet combines the BEST OF KAPS/BALDUCCI AND A NEW TWIST ON THE MULLICA INSERT! Made of genuine lamb-skin. Kaps loader is built into wallet. Use as your everyday wallet. Has credit card slots and looks normal in every way. Has matching checkbook cover for the Mullica insert. Comes with illustrated book of routines! Addendum to instructions: The BKM wallet does not come with a slide as described in the instructions. Instead, any credit card can be used. You can't tell from the photo what a classy item this is. Not only the the material, but the build quality is top shelf. I've seen way too many overpriced wallets that look like they were hand-sewn by street urchins who never saw a wallet and didn't know what it was used for. 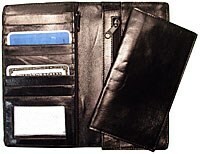 On the side with the zipper compartment (the "Balducci/Kaps" side), there is an acetate id window (this alone separates it from much of the competition; lack of one makes wallets look fake) and a stack of credit card slots that have a an actual seam - they're not just slits cut into an overlay panel. As noted, the credit card guide is a really nice touch. The "Mullica" side uses a leather checkbook cover for the insert - it's even made to allow you to lock the card in place so you can drop the insert and show both hands empty. But for all that, you know what the the real miracle here is? The price. How such a great wallet can be sold this cheaply truly mystifies me. If you like Card to Wallet, I have to think you'll love this wallet.